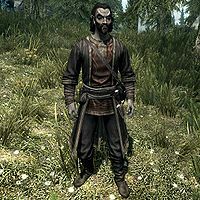 Taron Dreth is a Dunmer elemental mage who claims to be the "world's foremost expert" in Dwemer metallurgy and forging techniques. He is supposedly the author of The Aetherium Wars, but reading Katria's journal in Arkngthamz will reveal otherwise. After finishing Lost to the Ages, you may meet him on the road, traveling with three mercenaries. If you are wearing or carrying the Aetherial item you created, he will notice it and ask where you found it. If you refuse to tell him, he tells you he'll take it from your corpse and he and his mercenaries attack; otherwise, the other two conversation paths will lead to you mentioning Katria, and he will attack after that, saying you know too much. If you have sold the Aetherium item or are otherwise no longer in possession of it, you will not be able to engage in a dialogue. You can however still initiate combat by attacking him without incurring a murder charge. He wears unique robes and a standard pair of boots. He is equipped with a leveled dagger which can be up to glass quality, and has a chance of carrying various other items, including potions, ingredients, a leveled staff, and three pieces of Dwarven scraps. When near him, and you don't have the Aetherium item with you, Taron will say, "You need anything, talk to Master Dreth." He may also dismiss you instead, saying, "Out of our way. ", or "Stand aside." You can ask him who he is, and he'll proudly tell you, "Taron Dreth, the world's foremost expert in Dwemer metallurgy. Not that you would know anything about that." When asked what he is doing here, he'll respond, "I'm on my way to Markarth to confer with my colleague, Calcelmo. I've no time to stop and chat." If you are wearing or carrying the Aetherium item you made, he will walk up to you and say, "Your crown/shield/staff... gods, it's made of Aetherium! Pure Aetherium! Where did you find it? Tell me!" Asking him who he is will have him reply, "Taron Dreth. The world's foremost expert on Dwemer forging techniques. Now answer my question!" If you instead tell him that you made the item, he will be horrified: "What? You... you found the Forge? The Aetherium Forge?" Either way, you can also mention Katria to him, and he will be fearful now that his fraud was discovered: "Katria? No, no that's not possible! You... you know too much. I can't afford to let you live." He and his mercenaries will turn hostile and attack you. Another option is to refuse to answer, and Taron will exclaim, "Then I'll take it from your corpse! Kill him/her!" as he prepares to attack. You can also walk away without telling him anything, though he will also turn hostile: "No answer? Then I'll take it from your corpse!" Taron and the mercenaries may not become hostile after mentioning Katria to Taron Dreth. ? Taron may only use generic NPC dialogue, without any option to speak to him. This page was last modified on 16 November 2017, at 08:24.